Located in Santa Barbara, California the team at SecureDocs, Inc. is dedicated to building software solutions that are highly secure, easily adopted, and affordable for any type or size of business. To help businesses work quickly, efficiently, and securely. 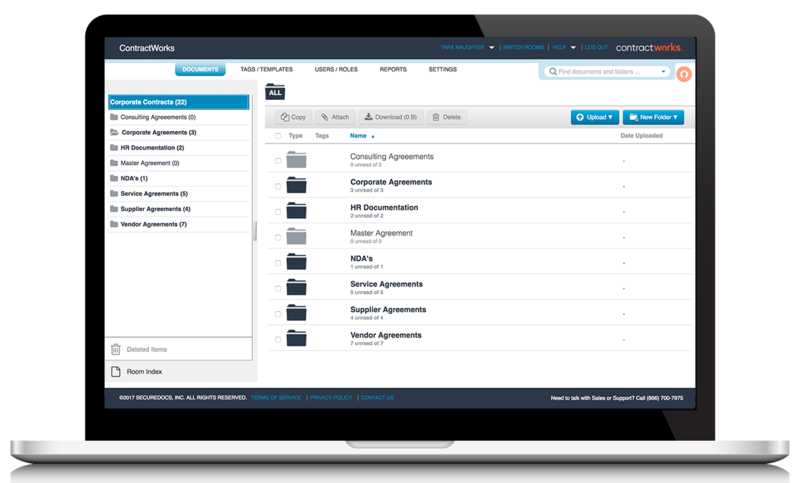 We offer two products - ContractWorks Contract Management Software and SecureDocs Virtual Data Room Software- both with built in electronic signature capabilities. Both intuitive software products can be set up in minutes, and are priced affordably for businesses of all sizes. The SecureDocs, Inc. leadership team is dedicated to building highly functional software for business. Will led the initiative to spin SecureDocs out as a new and separate business from AppFolio Inc. at the end of 2013. Going forward, he will oversee all aspects of the company’s strategy and development as well as building on the already exceptional team that’s come together at SecureDocs, Inc.
Will has ten years of experience managing sales teams in the Software as a Service space. As an early employee at AppFolio, he played a key role in building a customer base and sales team for their Property Manager solution and latterly for SecureDocs prior to spin off. Previously, he managed teams at Citrix Online, selling products such as GoToMeeting and GoToMyPC. Will moved to California from London in 2005 and only occasionally misses the rain. He holds a BA from Southampton University in the UK. As CTO, Rafael is in charge of technology and engineering and he has been responsible for building and leading engineering teams for several technology companies. He likes working and living in Santa Barbara where he enjoys biking along its sunny beaches and hiking its beautiful mountains. Rafael has been involved in multiple technology companies. First, as VP of Technology at Tensor Biosciences. Later, as Director of Software Development at Expertcity/CitrixOnline from 2003 to 2007, where he was in charge of the GotoMeeting project and the Endpoint group. Most recently, Rafael was founder and VP of Engineering at RightScale from 2007 to 2013. Before working in industry, he was an Assistant Professor of Computer Science at the University of Southern California, where he worked on parallel and Distributing Computing. Rafael holds a Ph.D. in Computer Science from the University of California, Berkeley. Albert is one of the founders of SecureDocs, Inc. and part of the team that formed the spinoff from AppFolio. Albert is primarily focused on market validation, customer development, and identification of scalable sales and marketing channels. Albert has often been the public face for SecureDocs, Inc. serving as a key note speaker at several investment bank symposiums as well as a guest speaker at a number of accelerators and incubators. Prior to AppFolio, Albert has held a number of senior sales positions at Expertcity/Citrix Online. At Citrix Online, Albert helped define and sell remote access and support products that now have annual sales revenues exceeding $600 million dollars. In this role, Albert grew the Inside Sales organization from five team members to over fifty, with managers in multiple locations. Prior to Citrix Online, Albert held finance and field marketing positions at American Express. Comron has over a decade of experience designing and building business software for the web, helping companies do business online. Now, he is responsible for the technical architecture and implementation of both SecureDocs Virtual Data Room and ContractWorks. In his spare time he enjoys watching soccer, and is an L.A. Galaxy season ticket holder. Before joining SecureDocs, Inc. Comron was a Partner at Juliet Group, a boutique principal trading firm, where he helped to build a robust high-speed automated trading platform. Before that, Comron held senior engineering positions at AppFolio, contributing to every product line developed there including SecureDocs. Prior to 2007 he was a member of the engineering team at Citrix Online, responsible for the GoToMeeting family of products. Comron has a degree in computer science from the College of Creative Studies at UCSB. Laura first fell in love with technology in 1999, when she took on a marketing role at a startup out of a warehouse in Los Angeles. In her current role as Director of Marketing for SecureDocs, Inc. her focus is on building awareness of both the SecureDocs and ContractWorks products, putting a strong emphasis on educational initiatives that help the industries those products serve. Before her current position, Laura held marketing management positions at a number of software companies. Most recently, she served as a marketing manager at AppFolio, leading all marketing initiatives for the SecureDocs product prior to its spin off. Before that, she worked as Education Marketing Manager at Lesson Planet, an educational technology company where she built demand for their school and district products. She has been instrumental in launching several companies and products across the music, education, and software spaces. Laura is active in the Santa Barbara software community and holds a leadership position at a non-profit focused on startup community building. Laura holds a B.A. from UCLA and an M.Ed from UCSB. After many years in the telecom industry, Casey has spent the last 12 years leading sales teams in the Software as a Service space. First with Citrix Online where he spent 8 years leading teams in the sale of collaboration software across the US. Later, as GVP of Sales for New Relic, Casey was fortunate enough to participate in a successful $100M IPO in 2014. Most recently, Casey was the EVP of Sales at Classy in San Diego, working with some of the largest non-profits in the world to improve their fundraising efforts. Casey holds a BA in History from UC Santa Barbara. Lorien manages our Account Management Team helping them work closely with our clients and ensuring they are successful using our products. She moved to Santa Barbara in 2001 to attend UCSB and graduated with a BA in Communication. She started her career in Customer Success where she excelled in going above and beyond for the customer. She capitalized on her experience in support when she transitioned to sales by always looking for the best way to help potential clients. Lorien comes to SecureDocs with over 10 years experience in Customer Support and Sales, and she loves being part of a team that helps clients evaluate a software that can make them more efficient and save money. When she is not working hard in the office she enjoys going out for a run, doing yoga, or spending time with her family. We believe in providing our clients the safest ecosystem for business deals and online document storage. We believe that a sleek and simple user interface saves time and allows our clients to work more efficiently. We believe that business software doesn't have to be expensive in order to be highly functional and secure. We believe that our clients come first, and are committed to being available 24/7, 365 days a year to answer any questions and help resolve any issues as quickly as possible.